One of the primary complaints from audiophiles who prefer room-based-system listening to headphones is the way headphones image. Instead of a soundfield portrayed in front of you with the instruments’ dimensions in width, height, and depth placed precisely in space, a headphone places all the imaging information between your ears. While a good pair of ’phones can deliver excellent image specificity, detailed locational cues, and even depth and image height, it is certainly not the same experience. Darin Fong is very aware of this issue and has developed a software application that attempts to remedy this imaging conundrum. 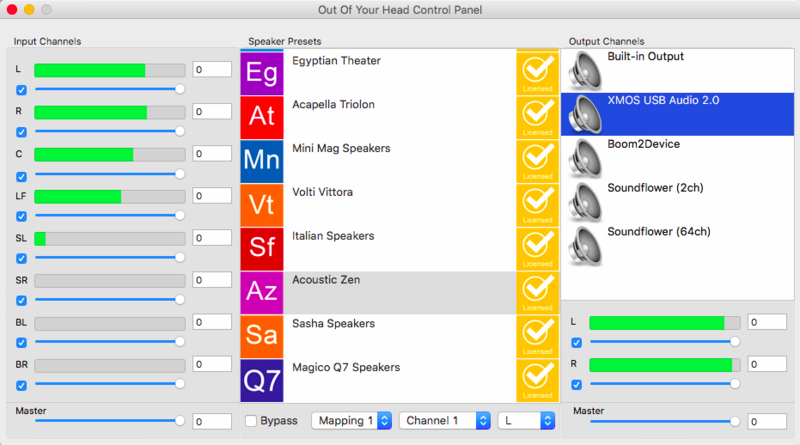 His Out of Your Head application uses measurement and modeling to recreate the imaging and soundstaging of various loudspeaker systems in different rooms with headphones. How well does this app simulate the room-based listening experience? Let’s find out. The Out of Your Head application is available for both Windows and Mac OS. For Windows, it requires Windows 7 or newer and for Mac it needs OS X 10.8 or higher. In both platforms, the hardware and OS must be capable of 64-bit processing. Once installed, your computer sees the OOYH app as a virtual sound card—all audio output will be routed to the OOYH app, and the app lets you select where its output will go. On my Mac, as currently configured, I had three options—built-in output (the speaker in the computer), Mytek Brooklyn (the USB DAC connected to my Mac), and Sonic Stream (a virtual sound card from the makers of Amarra). When I incorporated additional USB DACs, OOYH recognized and immediately brought them into the “Output Channels” list. Pricing for OOYH varies, depending on how many different speaker settings you want. The basic “starter” version is $149 and comes with one loudspeaker preset of your choice. Additional speaker settings are $15 to $25 each. For individuals on a tight budget, Fong has a “Gamer Edition” of OOYH priced at $24.95 that comes with no options for selecting speaker presets. This Gamer Version is a single 7.1 speaker preset, just like all the other 7.1 speaker presets but not based on a particular loudspeaker. According to Fong, “We created a preset which we felt delivers a great overall experience for music, movies, and games. Again, the Gamer Version is designed for non-audiophiles who just want great speaker virtualization with their headphones.” The Gamer’s license version can’t be upgraded to a “full” version. During the review I successfully used iTunes, Hulu, Audirvana+, Audiotools, Roon, and YouTube with OOYH. I had less success with Amarra and Pure Music, but this was because the latest Mac version of iTunes 12.6.01 kept crashing when I booted it up with these two apps—soon with an update I expect they will also be usable. Although not available yet, Fong is currently working on iOS and Android versions of OOYH for use on portable devices. Those could very well be a game-changing apps, if and when they come to fruition.